As shown in the pictures, there is a bolt that is just hanging there inside the spring and I don't know where it goes. Maybe I am missing a part that fell off the machine. I have marked the loose part with a red arrow. Please scroll the picture down and you will see it at the bottom. Appears as if it attaches to the end of that bolt, which is your tension adjustment knob/bolt. Looks like perhaps it's missing a washer to hold the spring in place? Combo 910 and it likely had the same tension head but i don't recall what it looked like specific to this. You could also send this pic to TennisMachines.com and get some help. Actually, looks like you are missing a bolt that goes through the end of the silver arm (which should attach to the gripper mechanism near the "front"
of the tension head. The hole for thew bolt would be to the right of your arrow at the end of the spring. Looks like it holds the end of the spring in place, that round nut would go on the end of the bolt, I THINK. Not sure how many spacers or bolts/washers etc you might be missing. That could affect calibration I would think. Someone with an Eagnas could snap a photo for you, should be the same tension head.). I have a Combo 910 manual, but it doesn't break it down in a diagram well enough to see any parts. This is a Gamma 6004 tension head, but they are all very similiar (in general). The more I think about it I would estimate your tension if off by at least 20 lbs on the low side. You have lost the spacing between you tension spring and the tension arm that drops down from the back of the gripper assembly. The gripper pivots at a point on the front of the gripper assembly. The tension spring applies pressure on the tension arm preventing trying to force the back of the gripper assembly down in a rest state. As the tension mechanism is moved away from the racket when you turn the crank the gripper want to pivot on the bolt through the front and the tension spring tries to hold it down. The preset tension determines how much pressure the spring puts on the arm as the crank is turned and after the tensioner locks out. 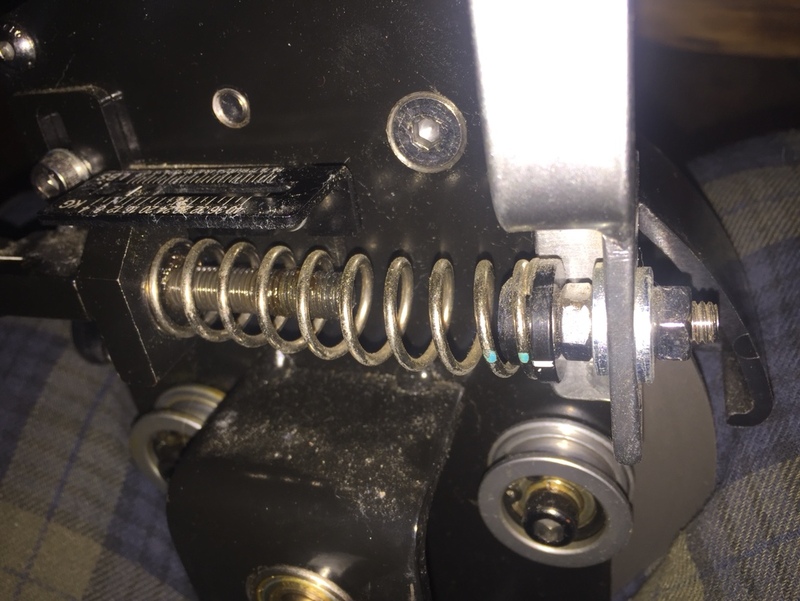 That tension spring also applies a constant pressure on the tension arm after lockout so there is always tension applied to the string even after lockout. Because you have lost the spacing between the spring and the tension arm your tension will be much lower than the preset tension. On a chance you can call Eagas and see it you can buy that bolt/spacer assembly whatever to replace it. If not a new tension assembly will cost about $150. You could also try calling Tennis Machines to see if they have the parts. You could use a bolt, locknut, and washers to get you in the neighborhood for a dirt cheap fix but I don’t know what the proper spacing should be between the spring and the tension arm maybe someone with an Eagan’s could help all the crank machines should be about the same. TennisMachines.com is not accessible right now. It says the domain expired. (314) 475-5773 don’t just leave a message. If you don’t get them leave 1 message then continue to call back every business day until you contact someone. By chance did you happen to find some parts on the floor? Thank you so much for all the responses. I'll look around in the house to see if I can find the missing parts. I googled "Penta Premium Stringer Crank Tensioning Mechanism" didn't see anything available in US. You won’t but W&D has that part and if you pay for Express mail you’ll have it in 2 days for under $150. There is also a Pros Pro tensioner for a few $ less but they’re not in stock. If you want the tension assembly from a US supplier you may try Eagan’s. Tennis machines may have a Prince crank but don’t go for a Gamma tension assembly. The Gamma tensioner is meant to mount much lower than most other cranks because it has a roller guide (similar to a Diablo but totally different.) if you use a Gamma tension assembly you will loose 360* rotation and the tension will pull from too high an angle. My eagnas only has a bolt and a round nut. Maybe it’s just finding a short bolt somewhere. Can you post a picture to help the OP? EDIT: Maybe the round nut that is inside the spring only needs a bolt from the outside through the tension arm gooing into the round nut to hold the spring in place. That being the case and it not being like the Gamma machine the tension may not be as far off and I had once thought. I’d like to post a picture but I never figured out how to handle the URL dialogue. It’s exactly like Irvin guessed. It should be fairly easy to do. @ElMagoElGato - Make sure you are logged in to be able to post. Right to the LEFT of the SMILIES Icon is the Icon for inserting the URL of any web based photos. You copy the URL [hint - use the ones with IMG] and paste the link. That's it. If you don't want to use the icon, then you can also insert the URL directly. However, the photo must be clicked by the user to show rather than appearing inline. If all that is confusing just post the link and I think it should work if it’s a jpg. If not the forum software will treat it like a link and it will still work. You can post pics from the Tapatalk app directly from your phone. That's what i did above of the Gamma Tension head. Yeah, looks like you could take that round nut to a local hardware place and get a short bolt of about 2-3 inches and a little bag of washers and nuts just in case you need them and rig it up like the picture Struggle posted. As long as you can calibrate it after it should be no issue at all and solvable for a few bucks. Of course if you can find the parts on the floor somewhere that would be even better. You will probably still want to calibrate it to be sure your tension is correct afterwards. Can anyone see this link? The link doesn’t appear to work. Nobody can see my link? Perhaps one has to be logged in to OneDrive to access the picture. That is correct no one can see it. go to tiny pic (http://tinypic.com/) and upload you picture. Copy the IMG Code for Forums & Message Boards link and paste it in a post. EDIT: That link is usually the second link in a group of about 5. How about this? It’s a shared album on snapfish. That works but it is a link to the picture and not a jpg so one must follow the link to see the picture. Put some loc-tite on it.